Organize the desktop, which launch frequently used programs and files can be done with one mouse click, is the most convenient. This feature provides a quick launch bar of Windows. All that is required is to display it on the taskbar and add shortcuts to the necessary programs, files and folders. If your Windows XP displays the quick launch toolbar, install it. To do this, right-click the mouse on the taskbar and select the context menu option "Properties". In the opened window, select "taskbar" and tick the box next to "Show quick launch". Click "Apply" and "OK". If the label component you want is on the desktop, drag it to the quick launch toolbar by pressing and holding the left mouse button. In the same way you can move the panel a shortcut to any program, folder or file from their original location. In Vista display a quick access toolbar and the space of labels is almost the same as in XP. To install the panel, right-click on the taskbar, in the ensuing window, select the menu "Toolbar" and select the checkbox for the option "Quick launch". Drag and drop shortcuts mouse is exactly as in XP. From the start menu, you can export the labels to the panel through the context menu by right-clicking your mouse over the desired component and selecting "add to quick launch". Before you can add a shortcut in the quick launch toolbar Windows 7, you need to install it. To do this, click the right mouse button on the taskbar and uncheck "lock the taskbar". Then here select "Panel" and the option "new toolbar". In the opened window enter the name of the folder "%UserProfile%AppDataRoamingMicrosoftInternet ExplorerQuick Launch". Then click "Select folder" and verify that the taskbar appeared the quick access toolbar – Quick Launch. Click on it to place the dotted separators, right-click and get the context menu checkmark next to "Show signatures" and "Show title". This will leave on the panel only the icons, not showing their names. Click "View" and tick "Small icons" so the panel could accommodate more icons. Click the left mouse button on the Quick Launch bar and drag the dotted line to the required distance, clipping a certain area of the taskbar for the quick access toolbar. Right-click the mouse on the taskbar and tick "lock the taskbar". If you have not stopped the SP1 for Windows 7, created the quick access toolbar may disappear after you restart. To avoid this, install SP1. Add shortcuts to the necessary programs, files and folders on the quick launch toolbar by dragging them with the mouse. 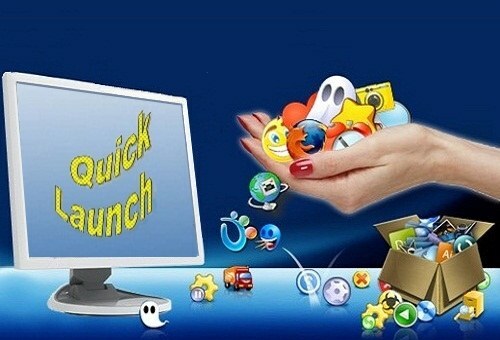 Release the mouse button when the cursor there inscription "copy to Quick Launch". If you are using a widescreen monitor, the control panel is conveniently positioned on the side, increasing its width to the same size (about 80 pixels) to the quick access toolbar placed 3-4 rows of shortcuts. This will allow you to place it 20-30 icons, and at the same time will leave on the taskbar has enough space to accommodate the icons of running programs and files.